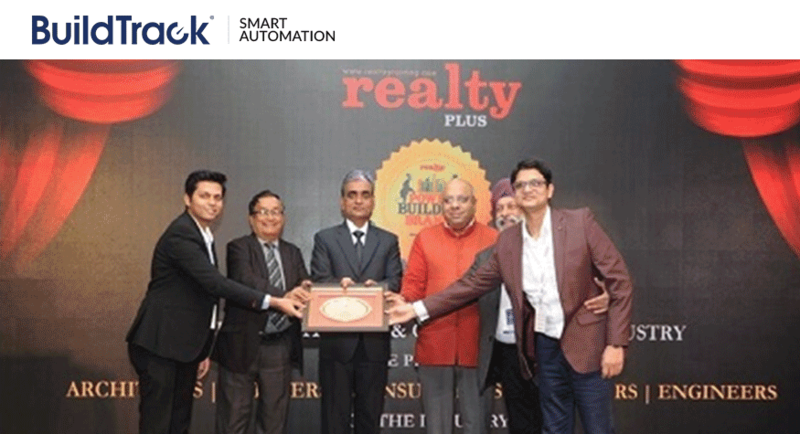 BuildTrack is delighted to announce that it has been awarded the 2017 Realty Plus Power Building Brands Award for Building Automation. Power Building Brands Awardis conceptualized to felicitate the associated industries of the real estate sector.These awards honour and showcase the top brand of building and construction industry of India, who are the back bone of the construction industry and serves the entire fraternity never stealing the limelight from the high-rises. The award ceremony was conducted for honouring industries like Tiles & Ceramics & Stones, Bathroom and Sanitation, Wires and Cables, Home and Office Automation, Elevators and Escalators, etc. The award ceremony was held on 24th January 2017 at Hotel Leela Ambience Gurgaon. BuildTrack‘s Delhi team was present there to receive the award. The Guest of Honour for the evening was Rakesh Goyal, Vice Chairman; Rail Land Development Authority who felicitated the winners of “Power Building Brand Awards” BuildTrack was awarded under the “Building Automation” category. Click here to see more pictures from the event. BuildTrack is a leader in Smart Automation Solutions. BuildTrack offers a range of Smart Automation for homes, offices, hotels, hospitals, senior living facility, warehouses and more. Our Smart Automation solutions are intended to deliver Safety, Security, Comfort, Convenience, Energy Efficiency and Facility Management Efficiencies. Visit www.BuildTrack.in for more details.